International Journal of Research in Health Sciences,2014,2,1,406-409. 1-Department of Ophthalmology, Mamata Medical College and General Hospital, Khammam, Telangana, INDIA. 2-Department of General Surgery, Mamata Medical College and General Hospital, Khammam, Telangana, INDIA. A 6yr old boy presented with complaints of swelling from the left parieto-temporal aspect of the scalp continuing into the temporal fossa which was gradually increasing in size since 2yrs and forward protrusion of the left eyeball since 2months, mild axial proptosis with scleral show. Systemic examination showed enlarged pre-auricular and submental lymph nodes bilaterally. 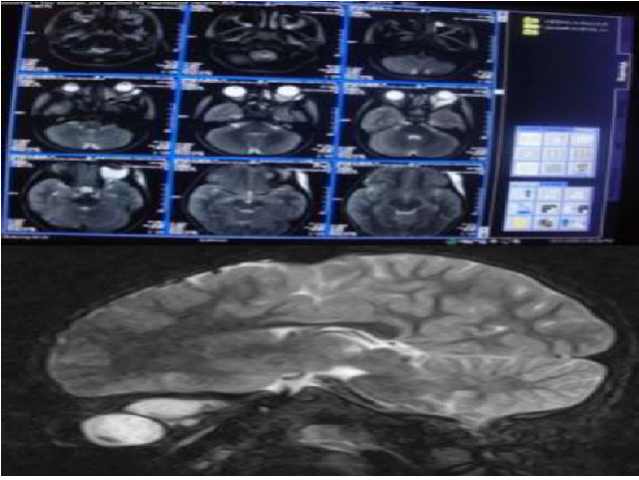 The CT scanning of brain and orbits showed two separate masses an intraorbital multicystic mass in left retrobulbar area and a parieto- temporal region. Combined intervention by the neurosurgeon was done for excision of masses and sent for histopathological examination. Complete ptosis noticed in left eye in 1st week. B-scan of left eye showed normal study postoperatively. Ptosis was corrected by Frontalis Sling Surgery. So hereby reporting a rare case with two noncommunicating orbital lymphangiomas.